Easy access to the cosmopolitan towns of Paphos and Limassol and 15 minutes drive from Paphos Airport. This is a very safe lockable gated villa on a modern and quiet development. If you ask any Cypriot, they say the best hidden gem in Cyprus is Pissouri. Our villa is a luxury home from home with everything you could ever need for your stay. The local people are so very friendly and cannot do enough to welcome you. On Wednesday and Saturday, you have to try the Cyprus night party in the square there's traditional dancing Greek mezzes and ofcourse the local vino! Take a camera. For more pictures click on weblink below. Built on the natural incline of the landscape, Panorama view offers beautiful sea and mountain views, boasting living areas that extend on to a large sunny patio and your own private pool, as well as a private roof terrace for sunbathing and watching the sun go down, BBQ area with sink and traditional Cypriot rotating BBQ and a glass of wine will assist you here! I bought the villa off-plan and on recommendation of a friend in 2005. I had never visited Pissouri before but have never looked back, falling in love with the place the moment I set foot in the village and now try to visit a couple of times a year. Enjoying the local food and drink (to its full potential!) and have often sat out in the local square socialising with friends, family and the locals until sunrise. A lot of thought and time into ensuring the villa's gardens and interiors are aesthetically pleasing and functional and our mission is that guests come home having had a totally enjoyable holiday. Also having children of my own the villa is also suitable for families with small children. Equipment is available on request. Recommended to us and we have never looked back. The development is small and set away from the centre of the village and it's quiet with the most stunning views. Peaceful location, in a what we feel is a hidden part of Pissouri, 3-5 minutes drive from the square and local village shops and a short drive to the beach and golf resorts. Good complimentary air conditioning though please turn off when not in use. Washing machine available for use and clothes horses available for drying. 2 private parking spaces behind lockable gates. Dry good available, please replace pasta, rice, sugar and anything else you may use. Lots of cooking equipment and serving dishes. The owners cook there a lot as David used to be a chef. Cooker, microwave, fridgefreezer, washing machine, toaster, kettle, toastie maker. Good dinning area for family and everyday use. Available on request. contact owner for costs. Portable DVD player with local radio - BFBS is the forces radio - rather like BBC Radio 1 and Radio 2. It is very popular. A selection of books and magazines are available. A few CDs are available in the cupboard. Lemon, lime, orange, gaurana, peach and grapefruit trees. Feel free to eat the fruit! Balcony overlooking the sea. You can see past Limasol and watch the sun set. Outside kitchen cooking area with sink. Skiing in The Troodos Mountains aprx 90 mins away but you will have to check on the weather and times of year. Crowning Aphrodite Hills Resort’s outstanding leisure facilities is the magnificent 18-hole golf course, designed by acclaimed course architect, Cabell B. Robinson. Five years in the making, it follows the scenic contours of the two plateaux, its challenging fairways cutting a swathe through lakes, olive and carob trees. No wonder the course has taken its rightful place among the very best the Mediterranean can offer. No matter how many times you play the course, there’s always a new challenge. Not least the skill needed to conquer the dramatic holes that run alongside or traverse the dramatic central ravine. Celebrate your success in the sophisticated Clubhouse, overlooking the 18th green and the sparkling waters of the Mediterranean below. A must for any handicap golfer. Shallow and Deep end , steps and rails to get in and out. Notes on accommodation: The interior of the villa has been fitted out to a very high standard and aims to give you a feel of luxury during your stay. Air conditioning is included free of charge, we just ask kindly that guests do not leave units on when not in use. We have tried to kit out the kitchen like home for your convenience. You will find some of the latest DVDs for your viewing or bring your own. CD player is also available if you bring your own music, or just listen to BFBS, the local station 92fm. Outside in the BBQ area you will find a fitted sink and rotating BBQ for your use (the local butcher Mick has the most amazing tasting meat) oh and you have to try the yogurt and honey for breakfast... amazing! A welcome grocery pack of essentials will await you on arrival if requested. A selection of dry goods in cupboards. Bed linen, towels are provided. Utility room with washing machine, broom, dust pan and brush etc for your use. Fire extinguisher. Fully stocked First Aid Kit. Outside: Built-in barbecue and preparation area. Sunbeds and garden furniture set. Roof top patio with wooden chairs and table and beautiful views. Garden and pool maintenance/cleaning will be carried out twice weekly. Private 8'x4' pool surrounded by beautiful mature gardens with fruit trees (limes, lemons,peach etc all edible if ripe) perfect in a G&T straight of the tree!! Utility Room: Washing machine, dustpan and brush mop and bucket. Hot and cold running water, kettle,BBQ and outside kitchen area Cleaning / Towels / Linen / Maid service: The property is cleaned before and after each visit linen and laundry is supplied for the duration of your stay. 7 days + services are tailored to suit. Mid-stay cleans/laundry services are available at an extra charge. Other: Spacious furnished roof terrace with panoramic sea views. Includes patio table and 4 chairs. Sun loungers are permitted to be taken up to the terrace if desired. Home from home. The property has everything needed for a fantastic holiday. Having recently returned, we hope to book for another holiday in 2019.
was perfect. We even managed to master a charcoal BBQ. Pissouri villa for family holiday. Second time in Pissouri and we may well return! Property was perfect for a relaxing holiday. Well furnished both inside and out. Good location about 25- 30 minutes easy walk to village centre. Pool was well maintained and interior was spotless. Air-conditioned throughout with tv/dvd and wi-fi. Contact numbers and general information available. Quiet neighbourhood. Safe and secure. Pissouri beach about 5 minutes away by car where there are opportunities to try a range of water sports. Village has a large supermarket well stocked with usual favourites. There are several good spots to eat including 'The Hideaway', 'The Two Friends' and 'The Bunch of Grapes' but there are also several other possibilities including a pizza restaurant. The village square hosts a Cypriot night every Friday in the main holiday season but it is also a place to sit and do a bit of people watching. Car is needed and property has dedicated parking driveway. Pissouri is only 25 minutes from Paphos airport via motorway. Definitely well worth considering if Cyprus is somewhere you would like to visit. Just back from an 18 night stay at this villa. Can’t recommend it enough. Pool area is brilliant and a real sun trap. The villa is in an ideal quiet location but to walk to the village is about a 30min walk so a car is required especially when it’s really hot. Villa is ideally and well equipped and Pam is a great help if there is any issues, only bad thing is the WiFi/TV can be a bit frustrating at times as the signal isn’t great but i found the best place to use on a phone or tablet the WiFi was up on the roof terrace but other than that i can’t fault the villa and we’ll definitely be back!! Property was lovely and quiet but showing signs of tiredness. Would stay again if ever went back to cyprus. The food and wine was a lovely touch on arrival . Great Villa, a sun trap with everything required. A welcome pack was provided which was great as we flew in late. Quiet area with a few local expats who have good knowledge of where to go and what to do. The village really comes alive at night even so late on in the year. Many great places to eat. It is s nice walk into the village but not so great for the more infirm. A car is needed if you are not great on your legs, but driving about is so easy. The views are fantastic from the villa. There are plenty of books to read and DVD's to watch if require. The bathroom was fine for us but the bath side a little high for a guest we had with us who is not great on her legs.The only reason I did not give the villa 5* is that the furniture on the upstairs seating area is in need of replacement as we couldn't sit on it, although saying that you could take up the loungers. The pool guy, he is so quiet when he comes he gets on with the job and unless you rise very early you only notice he's been when you use the pool. A great holiday, A great place. Lovely villa with fantastic facilities would definately stay there again. Short stroll from Pissouri village with great views. Welcome pack provided was a lovely touch and useful with our late arrival. Late check out also allowed - really flexible. Loved the pool and outside living - enjoyed the BBQ. Would recommend staying at this villa and will definately be back to Pissouri again. Hiring a car is a must but allows you to explore some great beaches on the island. Thank you Carol, So very pleased you enjoyed your stay. Activities near Pissouri include Tennis in town, water sports, water park, horse riding, golf within 10 mins drive, fishing. Great for walking holidays, rural/countryside retreats, beach or lakeside relaxation, a winter sun break, good nightlife, cycling holidays. The beach area has developed since the beginning of the 1980s from a jetty and one small taverna, into what it is today - an informal collection of excellent tavernas, a few shops, two banks, some apartments and one hotel. It is not an overdeveloped resort, as similar areas on Cyprus have become during the same 2 decades, but like Pissouri village, it has retained a Cypriot atmosphere. It is here that many Cypriots come on Sundays. The beach itself is clean, safe, partly sandy & partly shingle. 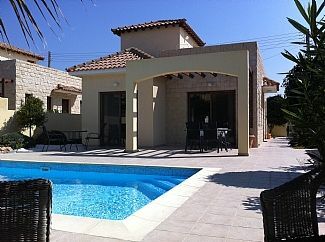 Paphos airport is 20 mins from the villa and Larnaca is Aprx 80 mins. It is very easy to find your way two and from both airports. Just follow the main duel carrige way to your destination. We can supply full directions and maps. Local shops, restaurants and bars are a 20-25 mins walk from the Villa. Nearest beach, around 5-8 mins by car. Coffee shops, cafes, banks, supermarkets are all situated here. Taxis always available day till early hours in village square .at a cost of a few euros .If walking is not an option then parking spaces can be found around the village and next to The Pissouriana Hotel (free of charge to our knowledge) taxis are all regular and local and will cost around 5 euros. Booking Notes: Terms are 30% on booking and balance to be paid 8 weeks before departure. Prices include cleaning and fresh laundry prior to your arrival. For 2 weeks stays the villa is cleaned and fresh laundry provided at the end of the first week. Holiday lettings are by the week (unless by prior arrangement) from 4pm on the date of arrival to 10am on the date of departure. The time lapse is to enable the property to be inspected in between lets to ensure everything is in good order. Deposit £100 refundable Changeover Day: Depending on bookings we can work around changeover days. Notes on prices: Prices are for the property per week in UK Pounds. Extra charges may apply to mid week changeovers. Wifi chargeable but options me. Discounts available for longer lets. Welcome packs with are included in prices. Price based on 2-4 adults. 10% will be added for extra guests.